Usually quiet. Courting males, thumping note and weak croak. Description: Small, pudgy duck. Bright chestnut body, black cap, white cheek patch, and light blue bill. 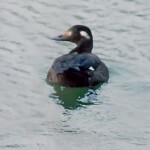 Stiff tail is raised when displaying. Female is brown with a dark line running horizontally across a light cheek patch. Female bill is brown. 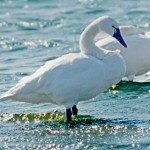 Habitat: Migrants prefer lake and reservoir habitats with open water and feeding areas with mud bottoms. Breed on prairie marshes with abundant emergent vegetation and open water. 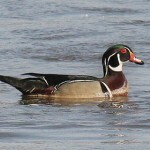 Where in Nebraska: Common statewide spring and fall migrant. Common breeder at Valentine and Crescent Lake National Wildlife Refuges. Uncommon breeder in sandhills. Rare breeder in Rainwater Basin. 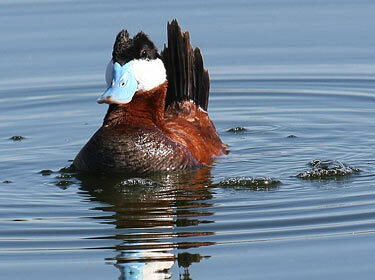 Fun Facts: The Ruddy Duck has spiky tail feathers that are used during courtship displays. Males blow bubbles to attract females and ward off other males.